I arrived at the Ogmore River on Sunday, headed straight for the nearest telescope wielding human and heard those words that strike despair into every birders heart. "If you'd been here an hour ago we were having great views, but it's flown off since and hasn't been relocated". As I scanned downstream the sight of hundreds and hundreds of Black Headed Gulls only dropped my confidence levels further. 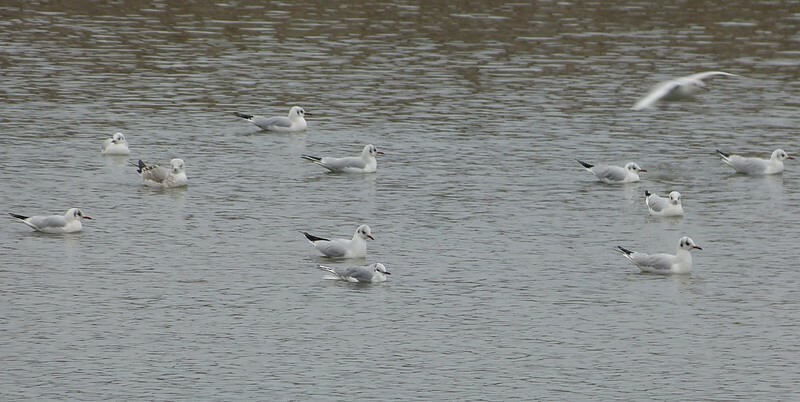 You couldn't have asked for a better place to hide a Bonaparte's Gull. Now normally I'd have just accepted the situation and gone off for a nice walk instead, but I fancied the challenge and kudos of being the first to re-find. Resigning myself to a lengthy search I duly stood around with assorted others as gulls slowly filtered their way past. Goosanders, Goldeneye, Mute Swans, Gadwall and what seemed like the worlds supply of Pied Wagtails joined them and kept us occupied before my feet inevitably became restless and I decided that a change of tactic was in order. Confirming that the Bonaparte's had last been seen heading towards the sea I set off in that direction, checking out every gull along the way. Soon enough I reached the point at which I could go no further and settled down to pick my way through the final two large flocks of Black Headed Gulls. Amongst them I found a couple of Common Gulls and a single Mediterranean Gull, the latter representing yet another new site for the species and me. Either they're extending their range or I'm getting better at spotting them. I was literally just contemplating that thought when the Bonaparte's popped up in the water directly ahead of me, seemingly from nowhere. My best guess is that it had been just out of my line of sight against the nearest river bank, though it was certainly showing well now. As with my previous Bonaparte's Gull in Devon this one was noticeably more erratic in its movements compared to the surrounding Black Headed Gulls, several of which kept chasing the former away. Again this was similar behaviour to that which I'd previously witnessed and is perhaps down to the others recognising a stranger in their midst. Unfortunately my chance to make further observations was short lived as a walker chose that moment to head right up to the birds and flush everything back upstream. Now if that was me I'd like to think I'd have put two and two together when I saw someone filming the birds and maybe chosen a slightly different route to avoid any disturbance. Instead I got the distinct impression that somehow I was in the wrong judging by the dirty look I received. Needless to say I didn't have the heart to look through everything again so I headed back to the car and let everyone I saw know that the bird was at least still on the river, if however once more lost. With a couple of hours left I headed over to Kenfig NNR where remarkably another rarity had popped up in the shape of a Black-necked Grebe. As soon as I arrived it could be seen fishing in front of the reeds on, as you can probably guess, the most distant and least accessible stretch of water. Nevertheless the dull conditions at least meant that the views I got were very clear and my thanks must once again go the finder. Also out on the water was the largest gathering of Pochard that I have seen in a very long time. There must have been at least eighty birds present but probably many more, not to mention another couple of Goldeneye, a single Wigeon and two Great Crested Grebes. It came as no surprise to find the paths on the reserve completely waterlogged and I reached the northern hide considerably muddier than when I'd set out. In the end I needn't have bothered as all I was greeted with was a dead Cormorant and yet more vandalism to the hide. Thankfully the southern hide seems to escape the worst of the abuse and I settled in to await the hopeful appearance of a Bittern. Unfortunately my run of good fortune couldn't stretch that far although I was accompanied throughout by a Kingfisher. I was first alerted to its presence by a large plop to my left, but for the life of me I couldn't work out what had caused it. Only after a good deal of hunting did I finally catch a glimpse of blue behind a large branch in one of the trees. A few moments later the Kingfisher once again dived into the water before heading up the left channel above to a post at its far end. From there it continued to fish, sometimes using a bent reed as a secondary perch. The only other sounds were of a Cormorant fishing and a Moorhen pushing through the reeds. It was a lovely way to see out the last few minutes of daylight and rounded off what had been a pretty spectacular weekend.